And then realized I made virtually the same dinner five months ago. And posted it. I'm totally losing it. But I'm going to post again, because this dinner is that good, that easy and that healthy. So you really should make it. You have to know that if I make something twice, it has to be good. 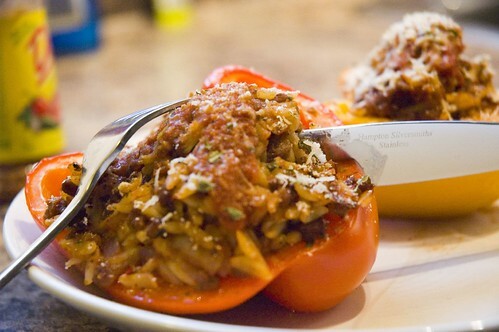 So here, you have some good old stuffed peppers. This is one of my favourite (clearly) easy, healthy weeknight dinners. And while I go on waxing poetic about its versatility, you'll note I made the exact same type as last time. In my defense, however, I was *sure* that last time, I had made mexican-inspired stuffed peppers....but alas it turns out that yet again, I deferred to my good old friend, Italy, for inspiration. 1. Put on a pot of water to boil, and cook orzo according to package directions. 2. 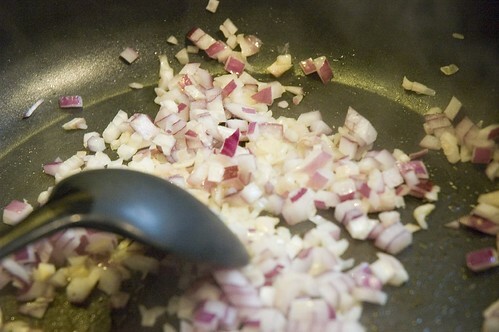 Meanwhile, sauté the shallot, onion and garlic (if you have it!) over medium heat in a large deep frying pan. 4. At this point, admire your beautiful peppers. Sadly, one of the red ones turned out to be icky inside. So I replaced it with a green one. 5. Now, carefully cut around the stem of one of the peppers. Halve the pepper, and remove the white innards. 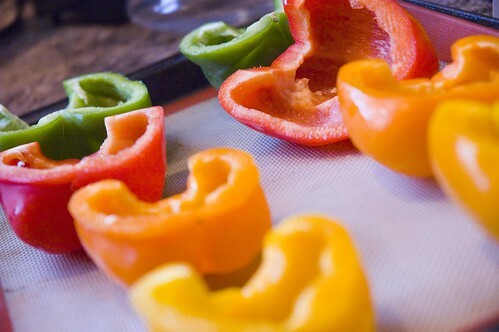 Do this with the remaining three peppers. Arrange on a baking sheet. 6. Preheat your oven to 400F. At this point, you should drain your orzo, and throw it in your skillet with the ground round and onion. Add in the pasta sauce, a half cup at a time, until you are content with the sauciness of your filling. You don't want it really saucy, because it will ooze out, but you definitely want enough sauce to flavour things! 7. Fill your pepper halves with the filling (two of my peppers were a bit small, so I had a bit of filling leftover - if your peppers are all large, this should work out just about right). 8. 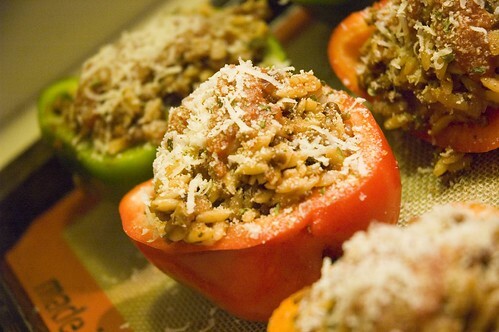 Top each pepper with about another tablespoon of sauce, and a half tablespoon each of parmesan cheese and breadcrumbs. This serves four people and is about 440 calories per serving. GREEK: use 8 ounces of rice, half a package of frozen chopped spinach and some broth to make the rice mix. Use ground lamb, if you like, and add in chopped tomatoes and lots of fresh oregano and black olives. A touch of cinnamon would be good too. Top with feta. MEXICAN: use 8 ounces of rice, and a package of taco seasoning (or, conversely, some broth and chili powder). Substitute salsa for the pasta sauce and top with grated monterey jack. Serve with more salsa and sour cream. MOROCCAN: use 8 ounces of couscous, add apricots, raisins and slivered almonds. Mix 1 T cinnamon and 1 T cumin into 2 cups of salsa. You could also add black olives. So really, even though I'm an idiot, you shouldn't let that stop you from making these. Everyone should make these. Thanks for reading!!!!!!!!!! And would someone please give the Sens a good boot in the arse for me? I'm not sure if it was Alanis' royal suckage of the national anthems last night or what (don't get me wrong, I am an Alanis fan.....but that sucked), but they were crap last night. Pffffft. I can see why you would want to post it twice. It looks really delicious and healthy. I love the way you photograph. What kind of camera do you use? That's one of my favourite saying. So glad you joined the DB's or I'd never have found your blog. The fact that you can make me laugh just from the title is great. These look really good and love the way you've presented them with the variable options. Since the first time you posted these peppers, I've made them twice. AND this time, I even have some frozen in the freezer because that's what you said you did last time. :D They are super yummy. I am definitely saving this recipe, as I have planted peppers in my garden this year and the first one is starting to show!! I'm excited to try this out. I, for one, am glad you posted again. When I saw your post on WB about having these suckers for lunch, I was about to go hunting for your old post so I could make these again. SO GOOD. I've made these a few times since you first posted and my husband and I love them. I've even brought the leftovers to work to share they're so good. Thanks for the options...I'll try one of those next time! lesley - you know what, I STILL have the last batch in the freezer....wonder if they're still good. They're super versatile - you can pretty much do anything to them and they're still good. deborah - oooo...growing peppers - very cool!!!!!! Were my thumb not completely black, I might try the same! The first time you posted I had all intentions of making them, but never quite got around to it. I am ashamed to say I did forget about them. made these peppers last night and they were awesome! 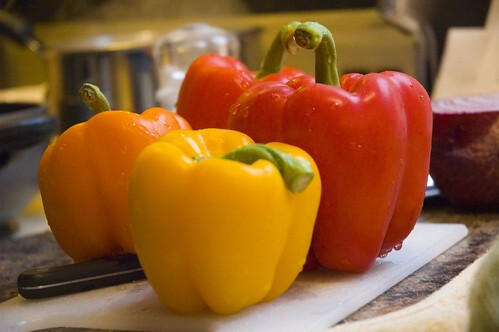 i've made peppers before, but this recipe can't be beat.... thanks much! it's about freaking time, eh?